Every parish catechetical leader (PCL) and youth ministry coordinator (YMC) must be properly prepared, educated and formed to lead and inspire the people of their parish in the faith of Jesus Christ. The PCL and YMC are more than coordinators of programs; the are visionaries and role models who desire to bring all people into a relationship with Jesus Christ. In the Diocese of Portland, certification includes: Theological Formation, Pastoral Formation, Ongoing Formation and Spiritual Formation. Theological Formation may be completed through online courses offered through three colleges. Pastoral Formation courses are offered through the University of Dayton's VLCFF (Virtual Learning Community of Faith Formation). 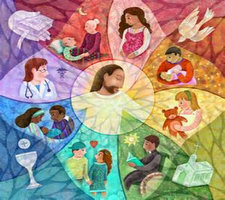 Ongoing Formation is provided by the Office of Lifelong Faith Formation through monthly meetings of the Lifelong Faith Formation Association (LFFA), a variety of ministry workshops, a yearly retreat and the annual Parish Life Conference. Spiritual Formation can be attained through reception of the sacraments of Reconciliation and Eucharist as well as other endeavors. Each course is one college credit. • Please contact OLFF staff if you need assistance. ongoing formation and ministerial development.